Country music performer, Josh Turner, was having a good time during his performance at the Grand Ole Opry this past February. But what he would announce as the feature act was yet to come. The pride of Hannah, South Carolina, surprised the audience by introducing his 98-year-old grandmother-in-law Lois Cunningham. This proves that piano lessons are a gift that lasts a lifetime. “La Fille aux Cheveux de Lin” is a piece written by the French composer Claude Debussy. 1862-1918 “The name means The Girl With the Flaxen Hair” It is a piece that many of my students have played. Practice hard and you will one day play it too. 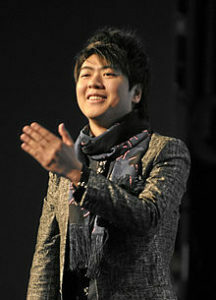 Lang Lang was born in Shenyang, Liaoning, China. At the age of two, Lang watched the Tom and Jerry episode The Cat Concerto which features the Hungarian Rhapsody No. 2 by Franz Liszt. According to Lang, this first contact with Western music is what motivated him to learn the piano.He began piano lessons with Professor Zhu Ya-Fen at age three. At the age of five, he won first place at the Shenyang Piano Competition and performed his first public recital. It wasn’t at all easy for this piano great. He was made to practice for hours and hours each day. At the age of nine his teacher stopped teaching him stating that he lacked talent! Lang Lang did not quit playing and today he is considered the world’s top pianist. He has played concerts all over the world. He has even played at the White House. Lang Lang is considered a piano “virtuoso” which means he can play any piece of music. He is amazing to listen to and to watch. First of all, NEVER QUIT! Believe in yourself. Don’t listen to negative people. Secondly, PRACTICE HARD! If you don’t practice you will never play well. Piano playing is like a perfect equation, what you put into it is exactly what you will get out of it.. PLAY MUSICALLY! It matters how you sound when you play but it also matters how you look. Are you enjoying playing? When you are well prepared and put your heart into your playing it will show. Just look at Lang Lang play, beautiful! This is a piano transcription played by Maksim Mrvica a wonderful Croatian pianist. It happens to be one of my favorite Youtube performances of the piece. It has gotten almost 7 million views! One of the things I want to do here at PianoParents.net is give you some great things to watch with your kids. My first video pick was a easy for me. I absolutely love every thing about this video! I show it to all of my students and they are amazed. Jarrod Radnich is a bonafide concert pianist with a wealth of training and accolades to his name. I came across this video a few years ago when I searched “Pirates of the Caribbean/piano”. I believe that what he is doing is outstanding because it is so inspiring for young pianists. I am including this link to his website where you and you child can learn more about Jarrod Radnich and the work he is doing.. Here is the video, watch and be blown away!